To fully leverage the new SDG agenda in service of girls and women, this community needs to engage new partners and players, move beyond our comfort zones, and leverage the data revolution. And there’s one field in particular that’s a great match: urban development. Women Deliver was a fabulous conference – well-organized, well-attended (with large numbers of high-level decision makers and young people alike), and thought provoking. At the end, we were all charged with going back home to focus on country-level work, using the SDGS as a means to create a social contract with clear accountability mechanisms that truly embrace gender equality. But in the process of country-level implementation, and in the spirit of a more comprehensive approach to development, let’s not forget cities. The conversation in Copenhagen was very much focused on making a difference at the country level, but the government actors discussed were almost always at the national or state level. Not thinking about cities is a missed opportunity. The UN predicts that by 2050, 70 percent of the world’s populations will live in cities. The scale and pace of urbanization, especially across Africa and Asia, is incredible. Cities are where the battle for sustainable development will be won or lost, as the Brookings Institution’s Homi Kharas says. An important opportunity to influence the urban agenda is coming up later this year. The United Nations Conference on Housing and Sustainable Urban Development, also known as Habitat III, will occur in October in Quito, Ecuador. Representatives from 193 countries will convene to sign off on a “New Urban Agenda” that will shape much of the world’s approach to rapid urbanization over the next two decades. The women and girls community should lend its voice to this agenda. Space is not gender-neutral. Girls and women are subject to, and fear, physical and sexual harassment and violence in public spaces every day. This restricts their freedom of movement, and impacts their ability to participate in public life, get an education, and earn a living. Gender-based violence is present both in the private and public spheres, and sexual harassment in public spaces remains a largely neglected issue in almost every city, with few laws or policies in place to prevent and address it. Trafficking and femicide in Latin American cities is a major problem, with the region accounting for 7 out of the top 10 countries with the highest female murder rate. In London, 43 percent of young women have experienced some form of street harassment in the last year; in Port Moresby, over 90 percent of women and girls have experienced some form of sexual violence when accessing public transportation; and in Kigali, 55 percent of women reported that they were concerned about going to educational institutions after dark. Being homosexual, bisexual, or transgender also puts people at greater risk of experiencing violence in public spaces. The UN is innovating in its response to public safety. The UN Women Safe Cities Program is the first-ever global effort to develop, implement, and evaluates tools, policies, and comprehensive approaches to prevent and respond to sexual harassment and other forms of sexual violence against women and girls in urban areas. The program partners with mayors’ offices, national governments, women’s groups, and other community partners. The more than 20 participating cities, including Quito, New Delhi, Maputo, and New York, have committed to a variety of actions, such as implementing relevant policies and laws, investing in public safety, and changing attitudes and behaviors to promote women’s and girls’ rights to enjoy public spaces free from violence. Beyond the UN, the private sector also has a key role to play. Take the example of public transportation. Inadequately lit roads and dark and empty bus stations are terrifying to most women. The ability to access safe, affordable, and reliable transportation, on the other hand, enables women and girls to participate in economic activity, access education, health, and other important services, and positively contributes to sustainable development. Making public transportation better and safer for girls and women should not be seen solely as a corporate social responsibility, but a corporate social opportunity. Designing public transportation systems with girls and women in mind has the potential to increase the number of paying customers for businesses as well as boost overall economic growth and female labor force participation. Habitat III has the potential to become a seminal moment in how these and many other urban challenges are approached. To have a real impact on the lives of girls and women, the New Urban Agenda needs to include results and specific recommendations along gender lines, including on violence and sexual assault. Accountability is the glue that connects commitments to results. Let’s make sure we continue to keep our leaders accountable and that Habitat III gets results for girls and women. Daniela Ligiero is the vice president of girls and women strategy at the United Nations Foundation. Sources: The Atlantic, Devex, Flacso, Habitat III, Human Rights Watch, UN Women, World Economic Forum. 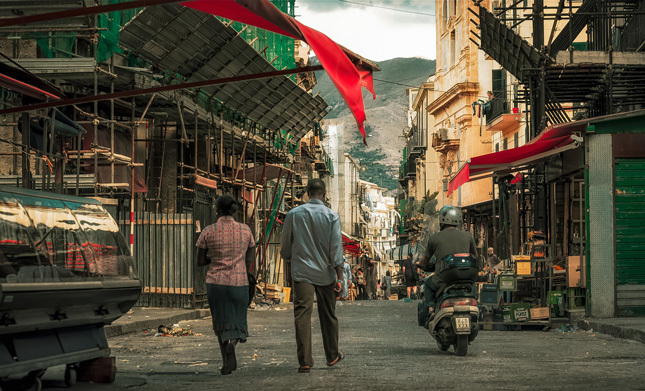 Photo Credit: Palermo, courtesy of flickr user Yiannis Chatzitheodorou.